Woodcock - a master of disguiseThe woodcock (Scolopax rusticola) is one of Britain's most enigmatic and elusive game birds. Country folklore has endowed it with an aura of mystery and magic, a reputation echoed by its superbly camouflaged plumage and its habit of appearing suddenly on flickering wings at dawn or dusk. Photo courtesy of Mike Read. 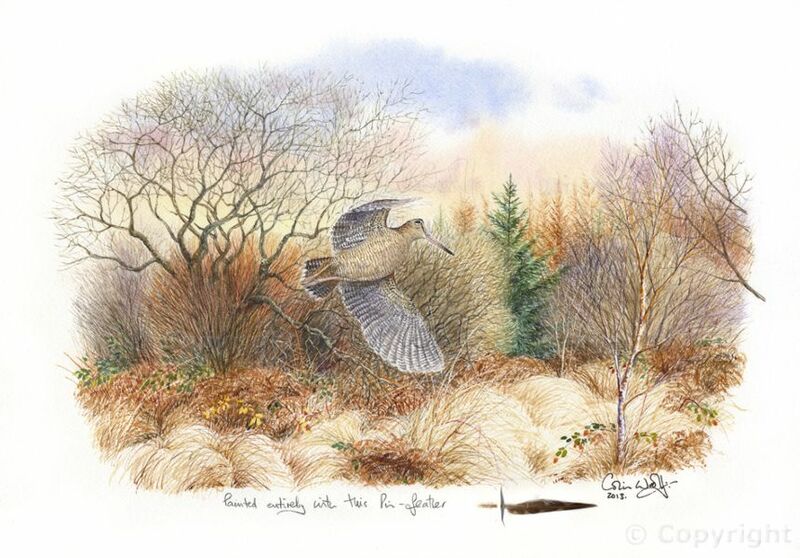 Colin's wealth of experience in studying and drawing woodcock has enabled him to produce a life size accurate resource for others to use as a guide for artists, woodcarving or modelling etc. For more information here ➤. 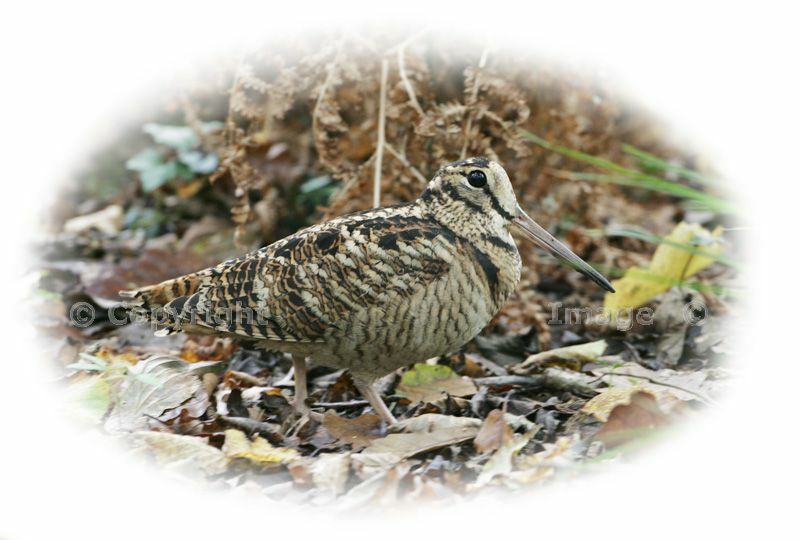 Some woodcock remain in Britain throughout the year and breed here. In summer the male's curious 'roding' display flight can often be seen just before nightfall. Masses of migrant woodcock arrive on our shores every autumn. A cold, clear night with a full moon often brings a silent 'fall' of woodcock into open expanses of moorland and pasture. The tiny pin-feather is found on the leading edge of a bird's wing. Only two such feathers occur on any bird (one on each wing). They are not exclusive to woodcock - all the birds that I have examined have pin-feathers, even exotic species such as flamingoes. The white, pointed tip of a woodcock's pin-feather can just be seen on the leading edge of the wing at left. 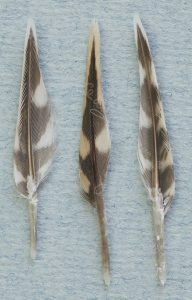 A single pin-feather from the other wing is shown in the middle, along with a feather from the back of a woodcock, to show just how small the pin-feather really is. 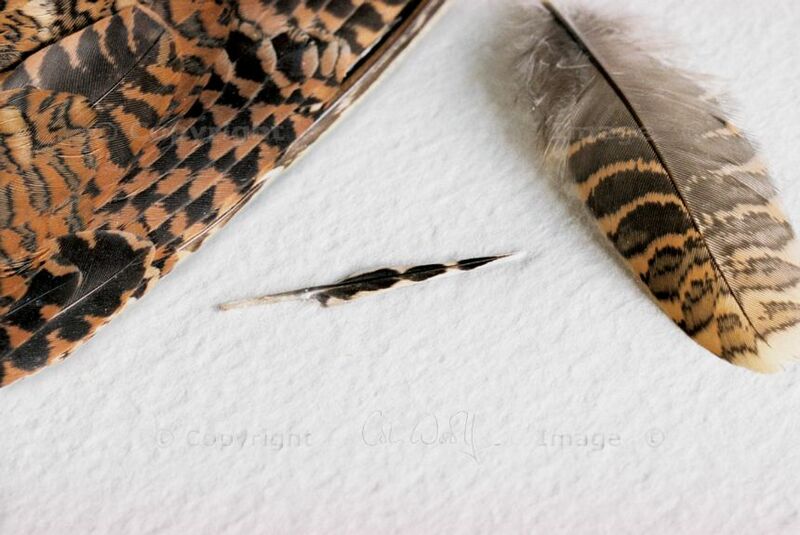 You can find out much more about pin-feathers in our book, 'Woodcock and Pin-feather Painting'. A close-up view of some pin feathers, the two at either side are from the underside, note the curled 'feathered edge' on one side, which is at the front edge of the wing (the leading edge). This edge is similar to the soft feathered edge to the flight feathers of owls. I have feathers from several different counties in Britain, from Scotland up to Cornwall, as well as from other European countries. Their length varies widely, from 23 to 38 mm. 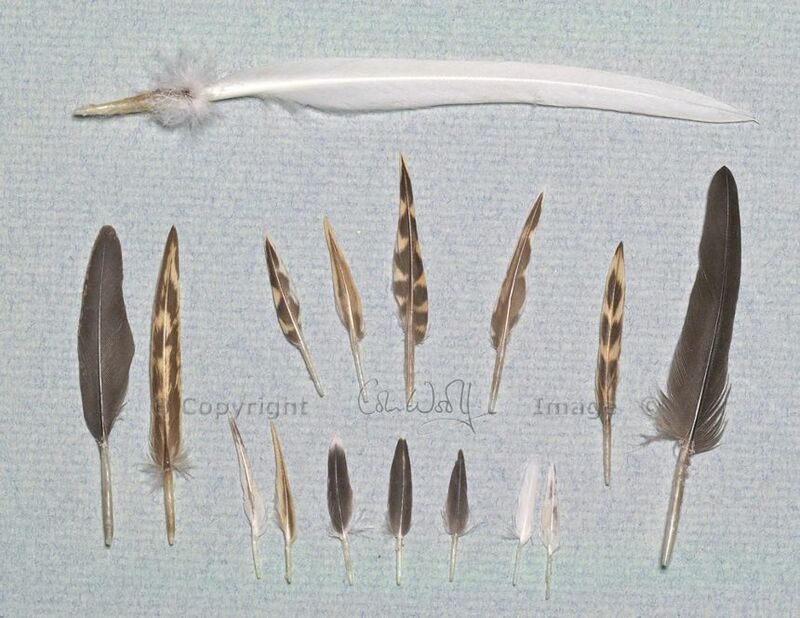 The picture below shows pin-feathers from a variety of species, such as swan, black grouse, capercaillie, snipe etc. Why paint with a pin-feather? In 1991, a gamekeeper told me about about the technique of pin-feather painting. The history of the art is somewhat obscure, but it is known that, in the 19th century, miniaturists used woodcock pin-feathers to paint portraits on ivory. It took a lot of patience to learn this technique. As an instrument for painting, a pin-feather is far from ideal, holding very little paint, resisting water and wearing down quickly at the tip. Having mastered the skill, I'm often known as 'the artist who paints with a feather'. Before beginning a painting, I have to sort all my pin-feathers and carefully grade them. I discard hundreds, and the chosen one may be the only usable specimen in a collection of 200. The feather is then mounted in my specially-designed holder. The phrase underneath each piece "Painted entirely with this pin-feather" has become a trademark for my work and is copyright protected. I insist on only using one single feather for each painting. After completion, the pin-feather is inserted into the watercolour paper, below the painting (see example at bottom of the page). I should add that I do not create all my wildlife paintings with a pin-feather! Most of the paintings that you will see on this website are produced using a traditional watercolour brush. More information can be found in our new book, 'Woodcock and Pin-feather Painting' which you can see here ➤. A woodcock flicks up out of cover and is soon away on surprisingly large, almost owl-like wings. 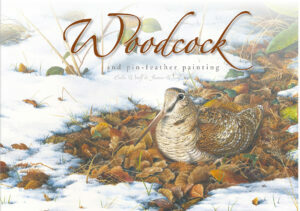 If you love woodcock or if you're inspired to know more about pin-feathers, you'll love our new book which is called ‘Woodcock and Pin-feather Painting’. This beautiful limited edition book focuses on the facts and folklore surrounding the woodcock, the challenging technique of pin-feather painting, and the history of this specialist art. You'll find more details here ➤. Do you have a collection of pin-feathers? If you have a collection of pin-feathers, and would like to see them put to a good use, please get in touch! If the collection is of a reasonable size, and one feather (or more!) turns out to be usable, you will likely receive a small original sketch by way of thanks. I would also be interested to hear from you if you have the pin-feathers of any unusual or exotic bird species. 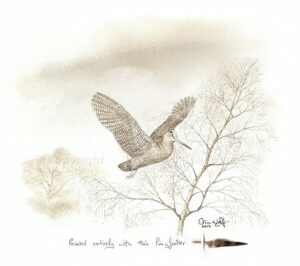 Woodcock pin-feather originals are highly sought-after the world over, they have an almost engraving like quality and are all unique as they have the actual feather used inserted into the paper before framing. If you'd like to commission your own unique pin-feather painting, maybe using some feathers that you already have - or even a pair from the same bird - I'd be delighted to discuss it further with you. In most cases I can create a background of countryside that reflects your own preference or locality.